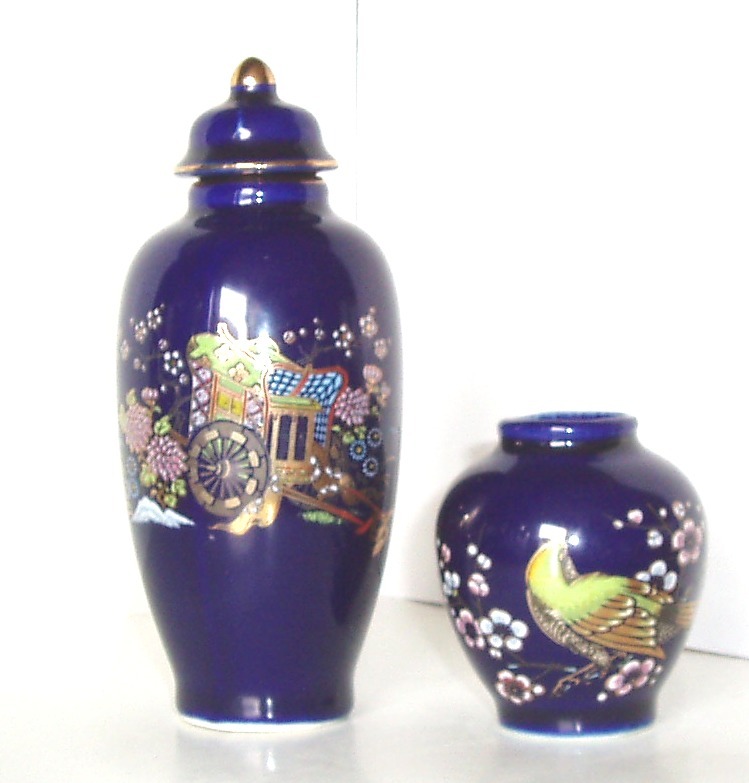 Vases "KUTANI" - porcelain, cobalt - are very decorative and have a high degree of collecting. The imperial tradition and style vases, even made in the modern (and I refer to the period "occupied Japan" and immediately after) porcelain objects (vases, urns, cans, boxes etc.) "KUTANI" are very fine and quality, form and keeping the unspoiled setting trends "kitsch" of "china" of all kinds. 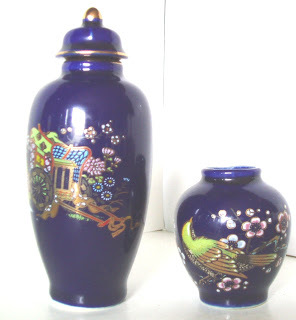 We here at the sale, a small urn (13.5 cm high and 5.7 cm diameter) and a miniature vase (6 cm height and 5.3 cm diameter) white porcelain enameled in cobalt color imperial partially decorated manually with colloidal gold and enamel, two-stage combustion in the furnace. 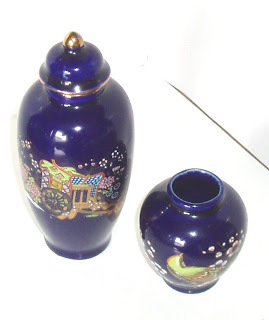 That basic design is done by transferring colloidal gold amid cobalt and enamel colors manually added sun in style "cloisonne-convex" - being slightly raised. It takes finesse and refinement for it, but it differs somewhat from "fake" others. The pieces are marked on the bottom, all with colloidal gold, lacking the "Made in Japan" which appears to many the like. 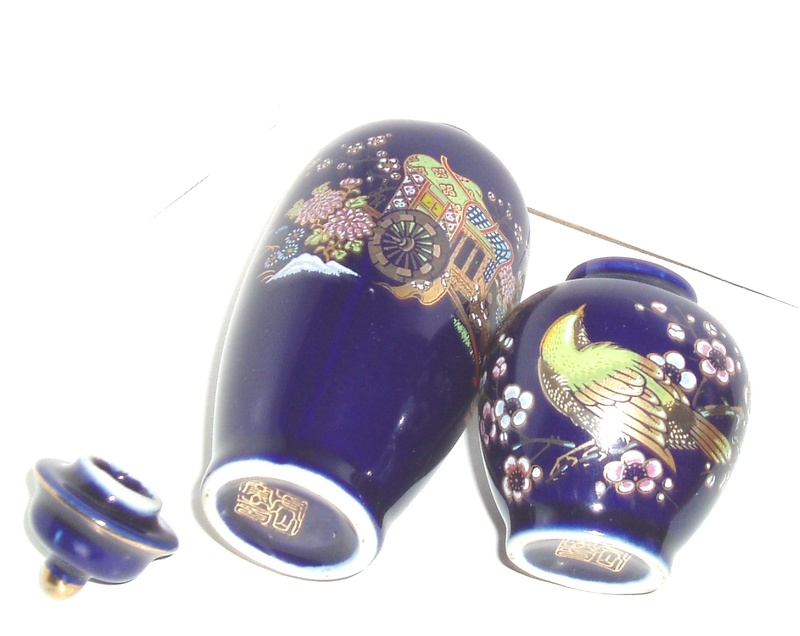 It is known that authentic pieces do not bear the "Made in Japan" because they generally do not use the Latin alphabet. In some cases can be met "Japan" or "Nipon" - the country used by the Japanese, not "Made in Japan". The pieces are like us, without defects. The decor is intact. I will insist on beauty, finesse and elegance of them - see the photos. About price, I can say? Search KUTANI COBALT VASE and you will find references.